In the midst of the second world war Pope Pius XII put the whole world under the special protection of our Savior's Mother by consecrating it to her Immaculate Heart, and in 1944 he decreed that in the future the whole Church should celebrate the feast of the Immaculate Heart of Mary. This is not a new devotion. In the seventeenth century, St. John Eudes preached it together with that of the Sacred Heart; in the nineteenth century, Pius VII and Pius IX allowed several churches to celebrate a feast of the Pure Heart of Mary. Pius XII instituted today's feast of the Immaculate Heart of Mary for the whole Church, so as to obtain by her intercession "peace among nations, freedom for the Church, the conversion of sinners, the love of purity and the practice of virtue" (Decree of May 4, 1944). The attention of Christians was early attracted by the love and virtues of the Heart of Mary. The Gospel itself invited this attention with exquisite discretion and delicacy. What was first excited was compassion for the Virgin Mother. It was, so to speak, at the foot of the Cross that the Christian heart first made the acquaintance of the Heart of Mary. Simeon's prophecy paved the way and furnished the devotion with one of its favourite formulae and most popular representations: the heart pierced with a sword. But Mary was not merely passive at the foot of the Cross; "she cooperated through charity", as St. Augustine says, "in the work of our redemption". In St. Mechtilde (d. 1298) and St. Gertrude (d. 1302) the devotion had two earnest adherents. A little earlier it had been included by St. Thomas Becket in the devotion to the joys and sorrows of Mary, by Blessed Hermann (d.1245), one of the first spiritual children of St. Dominic, in his other devotions to Mary, and somewhat later it appeared in St. Bridget's Book of Revelations. In 1799 Pius VI, then in captivity at Florence, granted the Bishop of Palermo the feast of the Most Pure Heart of Mary for some of the churches in his diocese. In 1805 Pius VII made a new concession, thanks to which the feast was soon widely observed. Such was the existing condition when a twofold movement, started in Paris, gave fresh impetus to the devotion. The two factors of this movement were first of all the revelation of the "miraculous medal" in 1830 and all the prodigies that followed, and then the establishment at Notre-Dame-des-Victoires of the Archconfraternity of the Immaculate Heart of Mary, Refuge of Sinners, which spread rapidly throughout the world and was the source of numberless graces. On 21 July 1855, the Congregation of Rites finally approved the Office and Mass of the Most Pure Heart of Mary without, however, imposing them upon the Universal Church. Excerpted from Catholic Encyclopedia, 1913 edition. 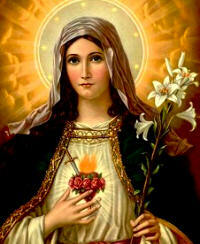 Read the entire article from the Catholic Encyclopedia about the Immaculate Heart of Mary. Read this article about Saturdays and the Immaculate Heart of Mary.